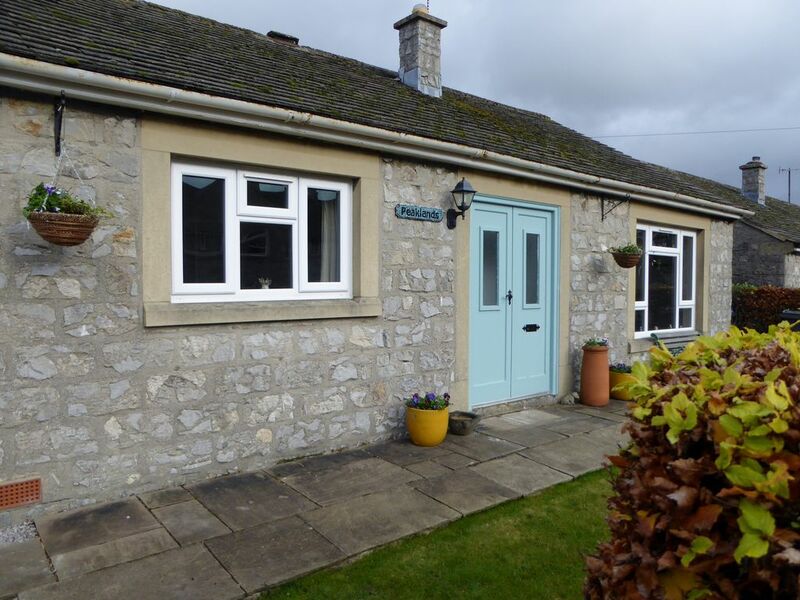 This attractive bungalow with a conservatory and pretty enclosed garden overlooks the cricket ground of the small picturesque village of Great Longstone, in the heart of the Peak District. Great Longstone is just 3 miles from the bustling town of Bakewell, with it’s weekly Monday Market; 1 mile from the lovely village of Ashford in the Water and 10 minutes away from Chatsworth Estate. There are two pubs in the village within 2 minutes’ walk providing good food and a warm welcome. The village also has a small convenient shop and a dairy where you can get milk and eggs. The cottage is an ideal base for cyclists and walkers being only 50 metres from the popular Monsal Trail. The trail runs along the former converted Midland Railway line between Bakewell to near Buxton making enjoyable walking and cycling options on the former railway line which enjoys lovely cafes and country pubs en route. Cycle hire is available from the Station at Hassop 1 mile away. As well as the trail, the village has numerous footpaths with walks through beautiful countryside and pretty villages that can be started from the doorstep. As keen walkers ourselves we have provided, for our guests, maps and route descriptions of some of our favourite walks and cycle routes. The area is also very popular for runners, climbers, cavers and mountain bikers as well as those wanting to visit the many traditional peak district villages and country houses. Dogs are welcome in most pubs in the area, we provide details of these in our welcome pack. We are happy to accommodate up to 2 dogs. The property is owned by two sisters, Jane and Sara. Jane is a Stained Glass Artist, her workshop is just around the corner. Sara is an accomplished musician and dog groomer. We live just around the corner and have lived in this beautiful village since 2000 so we can personally recommend the location, walks and surrounding area. It also means we are on hand for key collection or any queries during your stay without being intrusive. The property is centrally located in the village, has fantastic views of Longstone Edge and overlooks the cricket ground, in the summer months you can relax in the pretty garden, or conservatory listening to the sound of leather on willow. Walk or cycle down the Monsal trail, less than 500 yards away, this reinstated railway line with it's 9 tunnels is a popular draw for outdoor enthusiasts. We provide Tea, Coffee, Sugar. Very comfortable and cosy bungalow. Well equiped kitchen, we managed to cook our Christmas dinner with ease! We would have loved to have made use of the conservatory and garden, had we stayed in the summer. So we may come back as the walking in this area is great with plenty of routes available right from the doorstep. We didn't need the car all week! There are two good pubs in the village which serve food too. We had everything we needed and did everything we wanted to. If you're looking for a base for a walking holiday in the Peak District this property is perfect. Sorry about the late review. This is an absolutely gorgeous house. We immediately felt at peace and it is easy to tell that this is a very much loved home. Hope to return in a different season to enjoy the surrounding countryside. Delightful bungalow in a lovely quiet location ideal for exploring the beautiful surrounding area. This bungalow has everything you need for your stay. Plenty of room a pleasant garden which my dog enjoyed. The location is perfect for exploring this stunning area and the Mondale Trail is close by for those longer walks in the morning or evening with Walter (the dog). A welcome bottle of bubbly and milk was there on arrival which was a lovely touch. Plenty of storage for clothes wellies (if needed luckily for me not required this time!!) comfortable beds and sofa after a long day of exploring. Plenty of cooking pans Pyrex bowls but you might miss your dishwasher but a small price to pay as you have everything else. Only a small freezer section in the fridge but we only stayed a week and so not a problem. Do try the local farm for your milk eggs and fabulous yogurt. Bakewell market on Monday is busy but find the bread man his artisan bread is amazing. This bungalow is in a perfect location for exploring this stunning area you go out to the busy areas of Lady Bower Dam and Chatsworth and return to the peace of Great Longstone. Make a visit to Thornbridge Gardens you can walk there from the bungalow be careful to check out the days it opens it’s only a couple of days a week. Dogs very welcome if you are lucky enough to talk to the Head Gardener Chris your in for a treat a lovely man who shares his incredible knowledge willingly Enjoy your stay we did and will return there is still so much to see. A delightful bungalow: bright and airy, homely, very clean and well equipped. We thoroughly enjoyed our stay in Peaklands. The views from the property are wonderful and we loved sitting in the beautiful garden; great to have such a large, sunny conservatory too. It feels like a real home with many interesting and attractive features. There are many delightful walks nearby and we particularly like the nearby Monsal Trail for a level walk with some shade, and a good cafe and bookshop on the way to Bakewell. The availability of shorter bookings is a big advantage.